Don’t ask my wife to tell you this story, because to this day she gets visibly angry when she does. There’s a photo that’s been floating around the internet for a few years of a photographer who appears to be making a very sketchy leap from one precipice to another at the Grand Canyon. Its daredevilry has been debunked repeatedly (search for “photographer leaping [or jumping] at grand canyon” to see it), but I thought of it today as I was adding some images to our gallery from The High Road, the first vacation Abby and I took together, before we were married, in July 2003. We visited the Grand Canyon on that trip, and while it was smoky from wildfires farther south in Arizona, and insufferably crowded, it was still great to be there with her, and she’d never been there before. As Abby and I prowled closer to the rim to find a nice photo vantage, we noticed a father with a very young daughter, maybe six or seven years old. The two moved close to the edge, then to a stone prominence with a gap between it and the edge. The dad lifted the girl by her arms and, despite her rather terrified protests, swung her once, twice, and on the third time heaved her, screaming, across the gap onto the stone landing. 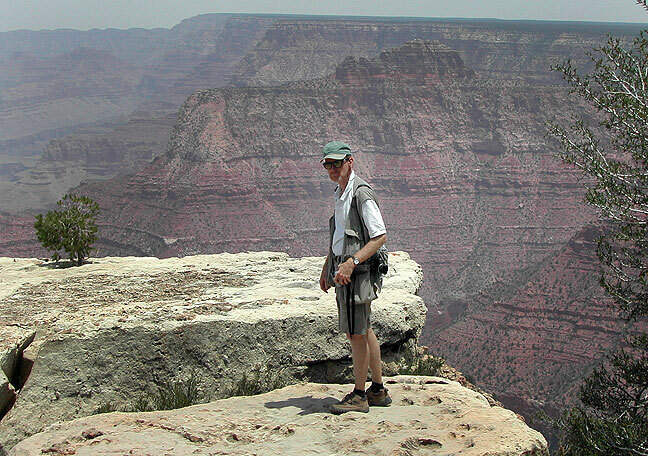 This is one of Abby’s images of me near the edge of the Grand Canyon made about the time the dad tossed his daughter across the abyss. How would have he explained that one to his wife if the heaving hadn’t worked out quite as he’d planned? People do all kinds of mind-boggling things to children, despite the best efforts of sentient humans. Had I seen the act in question, I’m sure it would be part of my Grand Canyon story too. Question: How did she get back across? As far as I know, she’s still there.